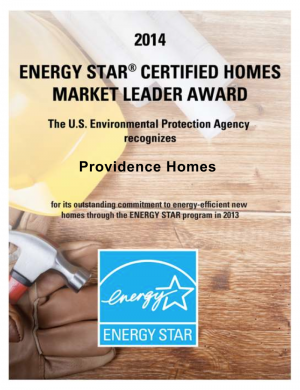 Providence Homes is pleased to announce that it has been recognized by the U.S. Environmental Protection Agency (EPA) with a 2014 ENERGY STAR Certified Market Leader Award (formerly known as the Leadership in Housing Award). Combined with previous Leadership in Housing Awards, this is the 5th consecutive year Providence Homes has received this award. Each year, ENERGY STAR New Homes presents Market Leader Awards to outstanding partners who have made important contributions to energy–efficient construction and environmental protection by building or verifying an outstanding number of ENERGY STAR Certified Homes during the previous year. “We are extremely excited to be recognized for the 5th year in a row by the Environmental Protection Agency for our commitment to building ENERGY STAR homes in the Jacksonville marketplace,” said Sean Junker, Providence Homes President and COO. “We believe that our combination of an ENERGY STAR home with remarkable curb appeal at an affordable price means we are able to offer homebuyers the opportunity to minimize their environmental impact without having to choose between their values and their budget.” ENERGY STAR certified homes offer homebuyers all the features they want in a new home, plus energy-saving features like effective insulation systems, high performance windows, tight construction and ducts, properly-sized and installed efficient heating and cooling equipment, efficient products, and third-party verification of energy performance. For more information about Providence Homes, please click here or check us out on Facebook!